It was 20 years ago "Today"
Oh I've been looking forward to using that clever post title for weeks. 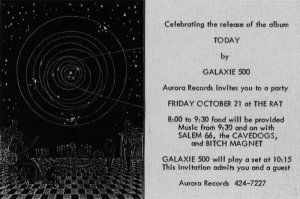 To be honest I'm not 100% certain of the exact date that Galaxie 500's first album was released. But I do know, thanks to a picture in the Box Set booklet, that the launch party took place at The Rat in Boston on 21 October 1988 and that was 20 years ago today. At the start of the summer of '88 we went back to Noise New York and recorded the Today album. We arrived at 2pm to find Kramer sleeping. We set up and did the basic tracks in about four hors on day1. Day 2 we did vocals and lead guitars, most everything in one take. I remember being completely lost during "Don't Let Our Youth Go to Waste" - there are strange harmonic overtones at the ned of that song that I was never able to replicate - sometimes it's good to have no idea what you're doing [...]. On the third day Kramer mixed the record, adding things as he went..."You know what would be hilarious here?" If anyone (that'll be Hefner I guess) objects to having there track here please get in touch and I'll remove it. I couldn't find an alternative version of It's Getting Late or Instrumental (I could have raided Snowstorm again but didn't really want to), if anyone has anything (or wants to make anything!) to fill these gaps please get in touch. In the meantime you can enjoy the Acura advert that featured Instrumental. Melody Maker called the LP "an astonishing debut by anybody's standards," and indeed it is. The incredible, supple beauty that Galaxie spun like straw was so sweetly melancholic that it all but smothered you. Damon's drums drift with the simmering presence of jazz classicism, Naomi's bass is rich with dreamy emotional content, Dean's guitar completes the aural landscapes begun by '69-era Sterling Morrison, and the vocals emerge from the Ouija board of eternity. A highlight of Today is the incredible primal-drone-hunch treatment the band gives to Jonathan Richman's "Don't Let Our Youth Go to Waste." Previously: On the 20th anniversary of Galaxie 500.